86% of Internet users research products online before they make a purchase! It’s more important now than ever to have a credible and trustworthy online presence for your business. FREE with our website hosting packages create a website that is right for your business and optimized to look great on any device. 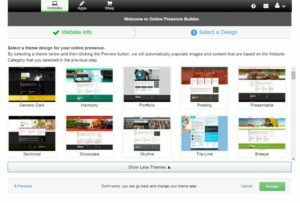 Online Presence Builder is an easy-to-use design tool! Anyone can build and maintain beautiful, mobile friendly websites that engage and attract customers. NO design experience required! It has never been this easy to look great online, just use visual editor, drag and drop design tools, engaged design themes, custom domains, hosting and mobile optimization. It’s never been this easy to look great online. Made for everyone: Drag and Drop editor allows users to easily create a website, and create a One-Page Website with a few clicks. Modern designs: Choose from engaging, SEO-friendly website themes that automatically look great on desktop, mobile and tablet devices. Engaging website elements: Add personality to your website. Easily add photo galleries, videos, buttons, Facebook and Twitter widgets, contact forms, appointment scheduling, Google maps, tables and lists and more. Add pages and layouts: Easily add multiple pages with different layouts such as galleries, menus, FAQ and more. Professional, modern images: Access a full gallery of modern, professional stock images, ready to use on your website, plus easily edit any photos with the built-in Image Editor. Access Online Presence Builder through the “Websites” tab of your Portal, where you manage your domain, email and any other related services. 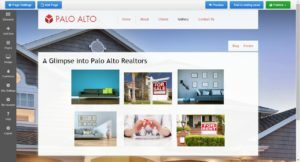 Click on “Get Started” to launch Online Presence Builder, selecting the domain you would like to get started with if you have multiple domains associated to your account. This is the onboarder, which helps get you started with a simple one-page website to Publish or customize. It’s that simple. The first step is to confirm your business details and select a category. Confirm or edit your website name and contact details. These details will be used to generate relevant images, content, a map and contact form. Click the logo section to add it now. You can edit these details or your logo at any time in the editor. Next, choose a design theme. You can change your design theme at any time. Finally, click “Preview”. You can toggle between devices to preview your one-page online presence in Desktop, Tablet and Mobile views. Clicking “Publish” will push your one-page online presence live. It’s important to get your website online as soon as possible to build credibility with search engines and start building your ranking. Now, you can edit your website at any time. When you select “Edit”, Online Presence Builder’s editing tool will open with your website. 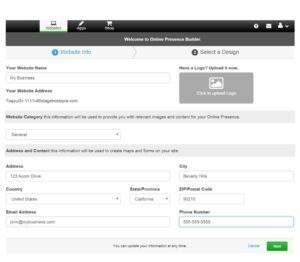 This intuitive, drag-and-drop editor has all the easy options you need to customize your website: add images, add new pages, edit your text and build a powerful website for your business. The menu on the left side gives you access to drag and drop-in different element blocks onto your web page, manage your pages, change your design theme and customize your site settings. When you select an element on the page, the menu on the right side will open up to allow you to further edit elements on your page. Click on an element to customize, for example clicking on a block of text allows you to input and customize your content. Images and galleries are an important way to showcase your business to website visitors. Drag and drop in a gallery block, and click to add and edit images. When you’re ready, click Preview to view your online presence on desktop, tablet and mobile screens. Click Publish to push your updates live. And that’s it! There are a ton of options for more customization and site settings, get started now to explore the full tool and take advantage of a professional, mobile-optimized online presence for your business. Establish an online presence. Customers are more apt to trust businesses with a professional, up-to-date website. Consumers often use websites to “window shop” and compare products and pricing. Having a professional online store will not only drive online sales for your business with new customers and new markets, but help drive traffic into your business. Online in minutes. Just select your design, confirm your business name and contact info and CLICK you’re online. A two-click set-up creates a landing page website with your details, map and a form to immediately start capturing customer interest. Then, start adding more pages whenever you’re ready. Easy to use. 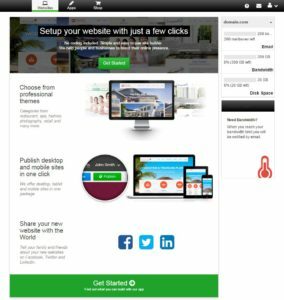 With fresh responsive design themes available with a few clicks, the Online Presence Builder is ideal for small businesses. 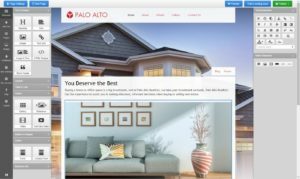 Build your website with confidence. Up-to-date content is key to getting found on Google and building credibility with visitors. Add content, customize text and images, create new sections, all with a new and improved drag-and-drop editor. Log in anytime to make updates on the fly. You don’t have to be a professional designer or know code to create and manage a website that’ll get you noticed. Why should I choose Online Presence Builder? No technical skills required: drag and drop editor, multiple layout options, social media integrations. Access to professional royalty free images. Responsive design – looks great and operates on any device. Ability to add new pages as you grow. Our plans are flexible and affordable, and can grow with your business. We provide more than just hosting or a website, we offer a complete online solution. Intuitive, user-friendly editor, with drag-and-drop WYSIWYG editing. Add in text blocks, images, image galleries, buttons, lead forms, videos, lists, menus, customer quotes, Google map, social media widgets and more. Add as many pages as needed. Hover help ticks and tricks. 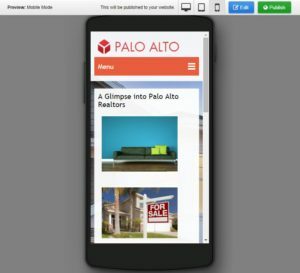 Preview your site in desktop, tablet and mobile views. Modern design themes mobile optimized for tablets and smartphones. Hero images with slideshow support, and pre-formatted royalty-free image selections. Add sleek image galleys in different layouts: classic, slideshow, filmstrip, mosaic and slider; add in YouTube videos, with built-in video search. Get social by adding a Facebook “Like” button, “Send” button, “Follow” button, Page widget or Facebook comments. Add in a Google map and Open Hours for your business. Layout content in columns, rows, collapsible rows, tabs, accordion style rows, and save reusable content. Drag and drop in pre-formatted blocks for headings, text, images, text links, image & text combinations, HTML snippets and block quotes. Add a lead form, call-to-action, tables and numbered or bulleted lists. 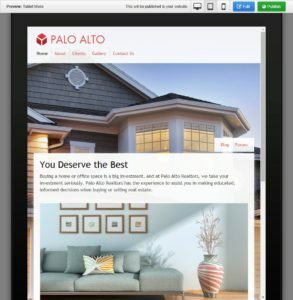 Access HTML snippets and block quotes..
A built in image galleys in different layouts: classic, slideshow, filmstrip, mosaic and slider; add in YouTube videos, with built-in video search. Add Google Analytics, embedded search, overall keywords and meta-description, Header HTML and more. Customize Page Name, URL, keywords and description per page to help in SEO efforts. Access a built-in resource Support Center for helpful articles on creating, customizing and optimizing your online presence.